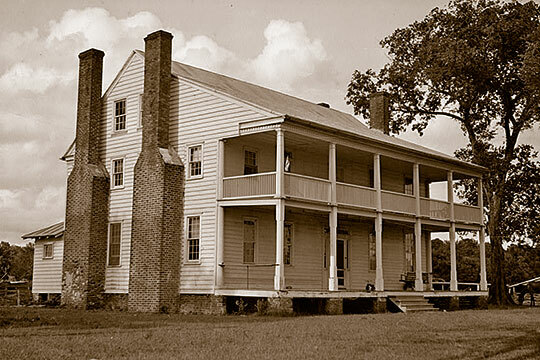 Photo: Sandy Point Plantation, ca. 1800, Sound Shore Road, Edenton, NC. Listed on the National Register if Historic Places in 1985. Photographed by Thomas T. Waterman, 1940, Historic American Buildings Survey [HABS NC-21], memory.loc.gov, accessed September, 2014. Chowan County administrative offices are located at 305 West Freemason Street, Edenton, NC 27932; phone: 252-482-8431. Chowan County was considered a favorable place to live long before white settlers arrived from Europe. One of the earliest expeditions of Sir Walter Raleigh in 1586 reported a Settlement of Chowanoke Indians numbering over 800. Several sites along the Chowan River provide extensive archeological evidence of these first inhabitants of Chowan County. Many settlers from the Virginia colony moved southward into the Chowan area but by 1700 no towns had developed. In the years 1712-1722 "the town on Queen's Creek," or Edenton as it was named, was laid out and settled. The original street pattern is still in effect through much of the town. Located on a fine natural harbor, the town became a focal point for the area and was named the capital of the colony. Although the colonial capital subsequently was relocated, Edenton was, at the time of Revolution one of the most prosperous settlements in the colony. Many fine homes were built at this time and still exist today. Edenton was the home of citizens important in post Revolution national and state affairs. Among these early prominent citizens were: James Iredell, U. S. Supreme Court Justice appointed by George Washington; James Iredell, Jr. and Samuel Johnston, early governors of the State of North Carolina. Edenton Planning and Zoning Commission, Chowan County-Edenton Land Use Plan, 1976, www.gpo.gov, accessed May, 2012.